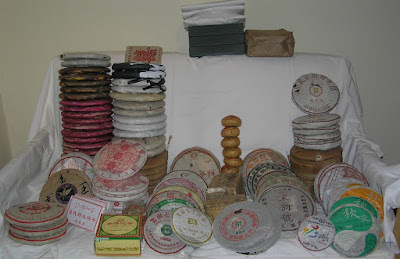 Here is my latest stash of my belowed pu-erh. So the tasting of five prestigious 98~99 arbor pu-erhs began with a sixth one. 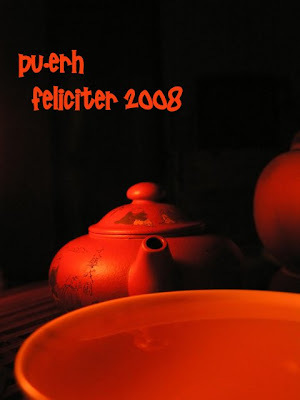 This is the one that was used at 5th International Aged Pu-erh Appreciation event in Pasadena. As you can see from the pictures, the leaves are turning brown, but they are still maintaining a bit of greenish appearance. The sample is torn out from the cake, so the leaves will be chopped even if the leaves in the whole cake would be intact. I used a small yixing pot, good enough for such a mighty pu-erh, the infusions times were rinse (short), first infusions short, then medium, then long. The liquor was crystal clear, very beautiful. What stopped me, were the smell and the taste of the tea. On about third infusion I remembered, what it tastes like - 2003 HK Henry Special-Ordered 7542 of MengHai. Same strange taste, Guang described it as "most unique fragrance of the ink stick used in Chinese calligraphy - a solid aroma of musk and pine wood with a very refined feeling" - well, the description is quite good, maybe I would mention a hint of "potatoes" on the background. I remember, that this was the taste I does not like about 2003 HK Henry beeng. I'm not sure if the problem in this special ocasion was in tea, water, preparation? Even with good, fresh aftertaste and long lasting tea (approx. 14 infusions) I would not buy this tea. Especially considering the very high price. I acquired this sample as a gift from owner of Czech teashop Longfeng.cz. Since it was approximately 9 grams, I decided to use whole sample with a slightly bigger (200 ml) yixing teapot. As the owner of the teashop claimed, this beeng was one of the first produced by Haiwan tea factory. The scent of dry leaves reminded me of 2000 Cheng Guang-He Tang "Yi Wu Yieh Sheng" brick sold by Guang. While I like YiWu pu-erh very much, I'm not a big fan of that particular brick, so I approached this tea with caution. As you can see from photos, the leaves were still pretty green, which could mean, that the tea went through clean dry-storage. I believe, that this particular beeng was stored in Czech Republic last few years slowing down the ageing. And since in the Central Europe is the weather pretty dry, it probably means, that my tea will also age slowly. After a short rinse in first cup of tea I immediately saw, how clear was the liquor - it went through a very good kill-green step, indeed. The aroma of the tea also reminded me of the CGHT brick, but I felt it a little less boring, livelier. The tea was sweet, with of woody and floral feeling. No smokiness at all. Aftertaste was long lasting (I still feel it in my mouth), fresh, filling the whole mouth. It was a sample, so the leaves were chopped and quite green for being nearly 8 years old. Oh yeah, dry storage. I liked a tea a lot, it lasted about 8 great and then other 4 very good infusions. Should I buy this cake? Well, if it is available, probably yes, one to drink. It is a bit expensive (about USD 100), but the quality is clearly visible. Fortunately for me, the cake is not available to buy, so I will not be tempted. On the other hand, I acquired one whole 1998 Haiwan YiWu cake (made under CNNP license), so I hope, that it will be pretty good, too. Today I received a parcel with some very-very good pu-erh, like various editions of Green Big Tree. I will try it with other teas I acquired in next few days. Oh, what a good start! For my new "tea-related online notebook" I decided to make a worthy beginning. So I cracked open my 2006 XiZhiHao 3-Year Anniversary Lao Ban Zhang. The cake itself came from Hou De - an expensive cake from a high-quality factory. Since I'm a big fan of San Ho Tang (and Hou De, of course :-) I purchased this beeng to drink. The cake alone is well crafted - there are lots of big leaves with full leaf-tips system – notice how the leaves were too big to fit into pot. What I like in high quality cake is loose compression. Well, actually, this beeng was compressed pretty much pointing out at very heave stone-molding. At least I believe that it was stone-molded. For this brew I carefully gathered the leaves from the top of the cake. From the fact, that some were darker, than other (check the pic). I used my 60s pear-shaped zhu-ni yixing – prepare to know it more in later posts. I started with quick rinse, short infusions – as usual. The amount of leaves was approx 7 grams at 120 ml yixing. The liquor alone was very light –appropriate for less than one year old tea. What I do not like in ban zhang mao cha is the fact, that it makes so calm and quiet tea. Like this one. Fragrant, pleasing, long (lasted about 12 infusions) with good aftertaste and round feeling in mouth. It is a kind of “clean” taste I like in the tea – feels like you just brushed your teeth with tea-flavored toothpaste. Conclusion – great cake. Very expensive cake. If you like genuine Lao Ban Zhang, you may give it a try – but newer Xi Zhi Hao products will probably cost less. It’s up to you, the tea will not disappoint you.